This was a landmark program also because the values that Soft Skills Studio believes in were in action. We don’t believe in switching off the lights since we have no ppts to run. The session went wonderfully well with flip charts on the walls and brainstorming ideas. And the post session support – another one of our promises – continues after the session. The session summary will be emailed and participants are free to individually discuss their blog plans with me. The above points easily equip a newbie to connect the thoughts and blog successfully while creating some brand presence on social media. You can hear what the participants had to say about the program in video testimonials coming up soon on the blog and social media. If you wish to have a program like this for your marketing/social media team, feel free to contact us on the blog or drop us a line in the comment. I love it when speakers ditch the distracting visuals for just plain old blackboards, or in this case, flipovers. It is about the speaker after all and not the gimmick. I am happy to find someone who agrees with me. I have always loathed the over dependence on ppts. I’d also compliment you on the lovely soft skills blog you have. I loved the history of soft skills and will also share on my blog with my readers. Thank you so much for dropping by and leaving your comments. 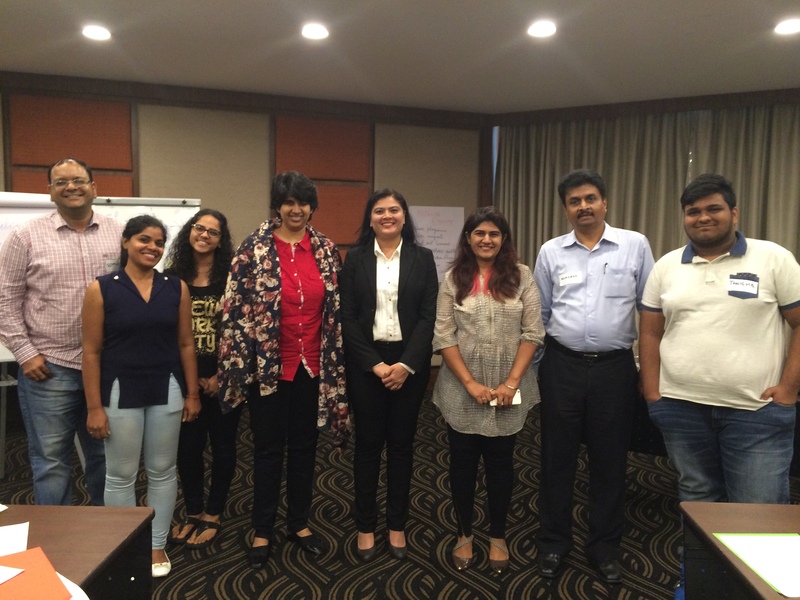 Thanks for coming to my Blog on Digital Marketing Training Mumbai and leaving a comment. That was kind of you. I hopped across to your Blog to look it over and enjoyed spending time reading this Blog post. Pity I did not get to know about the workshop on Blogging you conducted on the 25th June. I would have loved to participate, listen and learn. You have a very interesting and impressive background which intrigues me. When training, I pretty much use PPTs all the time. Seems we both have strong but differing views about PPTs. Hey! my call is that diversity is what makes people interesting. I really do spend a ton of time creating well animated PPTs blended with different transitions that I’ve found helps me engage with my audience. Truthfully, I find my handwriting a tad difficult to read. Hence, I’d really have a hard time engaging with an audience, using flip pages and a marker :-). I’d love to share some of my Blogging knowledge with your audience if you’d consider giving me the opportunity to do so. I promise we’d have fun and learn something of value as well. Thanks again for dropping by. Enjoy the day ahead. It would have been great to have you at the blogging workshop. You can still share your thoughts with me and readers of this blog through a guest post. I am looking for guest bloggers and would love for you to write here. Do let me know if you’d be interested. Feel free to drop me an email with your ideas and I can send you the editorial guidelines.